In high school we had a teacher who had a chip on her shoulder. She would always pick on our group (or so it seemed in our teenage minds) regardless of whether we were being good or a bit cheeky. After a while we knew that she would single us out and while she made her rounds at lunchtime we would try to reach an imaginary chip on our shoulder (mime protest). We discussed the flavour of her chip and then brushed imaginary crumbs off our shoulders. She had no idea what we were doing and this probably added to her idea of us being trouble. This idea of people walking around with a chip on their shoulder has stuck with me throughout my adult life and when I see someone being arrogant, angry or annoying I can get distracted by what flavour their chip might be. It’s a great distraction from their bad behaviour and my story telling/writing mind can get lost in the narrative of their Chip Life. 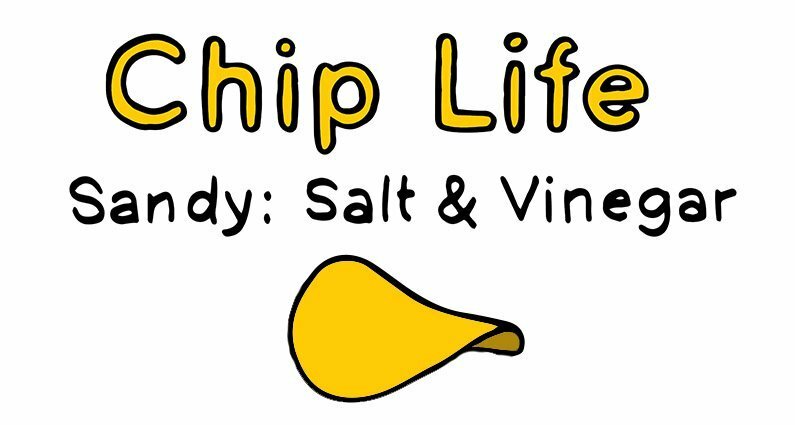 I have done a series of 10 illustrations of people wearing their chip… some of these are people I’ve met, some are characters from TV shows and some are people I watch on the train (in a totally non-creepy way) and imagine their life story + Chip Life. 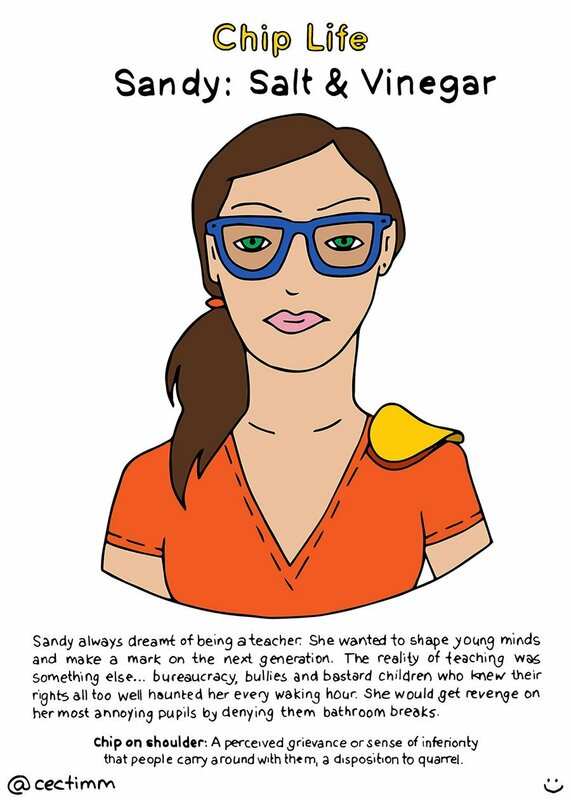 This is Sandy. We all know someone who has gone into teaching for altruistic reasons who end up getting beaten up by the ‘system’. This is true in many countries… not just Australia. Perhaps some teachers lord their power over their students because they’ve realised they will NOT be the great change maker they once dreamt they would be. Perhaps the teacher who inspired Chip Life was herself a disillusioned educator grabbing on to any sense of power she could – or maybe, just maybe she thought we could be much more if we applied ourselves rather than acting like a bunch of clowns. I will publish the remaining 9 illustrations in the days to come.